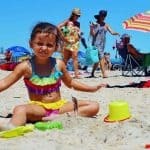 Currumbin makes a perfect family day trip or location for a family getaway. 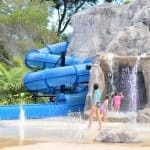 The area has calm water for swimming, playgrounds for entertaining the kids, and plenty of other nearby family activities. 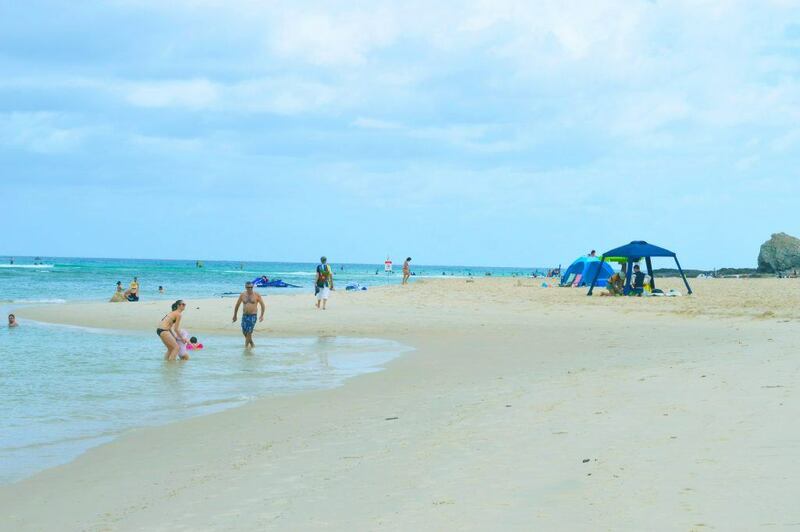 Currumbin is located on the southern part of the Gold Coast – close the New South Wales border. It is about 100 kms from Brisbane or approximately 1hours drive. 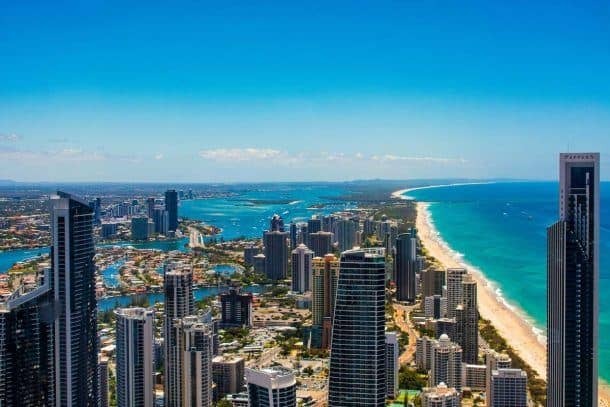 Currumbin is only 6 kms from the Gold Coast airport or a 10 minutes’ drive. 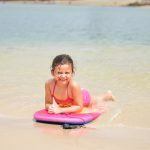 Whilst Currumbin has a fantastic surf beach, the ideal swimming area for families is the Currumbin Creek. 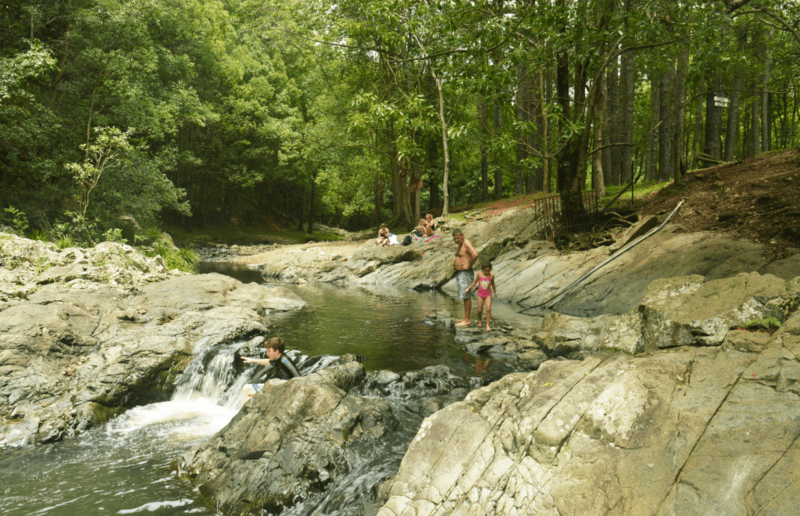 The creek starts deep in the Gold Coast Hinterland and runs through the pristine rainforest of the Currumbin Valley, offering various rock pools perfect for a dip along the way and then heads right out to the ocean at Currumbin Beach. 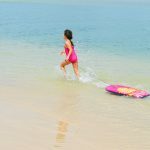 Right before the creek meets the ocean it opens up into this huge lake area which is ideal for a variety of water activities such as swimming, kayaking, canoeing and stand up paddle boarding. 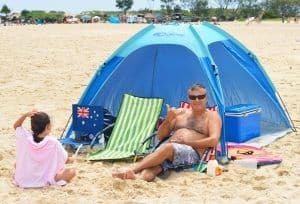 The sand here is perfectly white; the beach is wide and long, ideal for setting up a family beach tent and for kids to build sand castles. 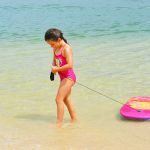 The water along the shore is crystal clear and shallow, perfect for little ones to splash about. 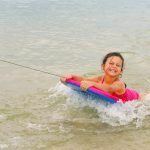 If you wade a little further the water is deep, great for older kids or other water activities. 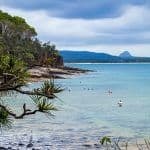 The area surrounding the creek is fairly under developed making it a beautiful escape from the glitz and glamour of the other Gold Coast beaches. You won’t find huge skyscrapers here, rather family homes and smaller holiday apartments. Parking towards the beach end of the creek can be difficult but as you move inland towards the hinterland it becomes a little easier. There are parklands along the creek including facilities such as BBQs, playgrounds and toilets. See above map for location. 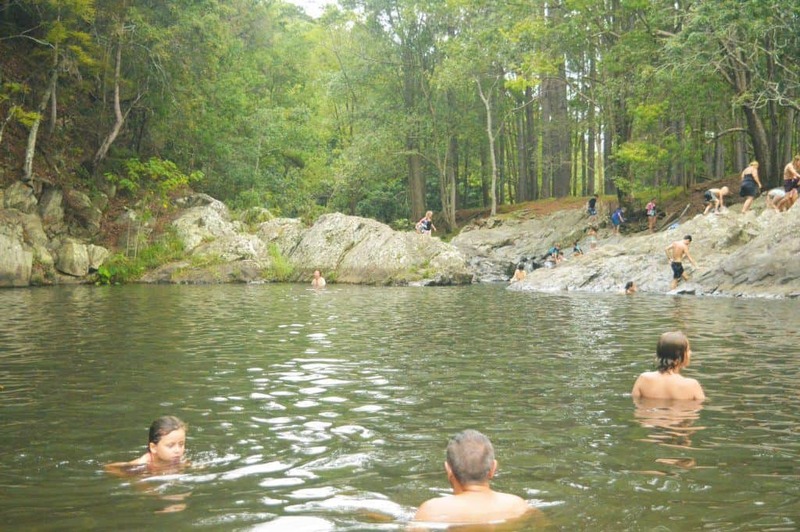 Located a 20 minute drive inland from the Currumbin Creek is the Currumbin Rock Pools. The drive through the Currumbin Valley towards the rock pools is gorgeous. The valley is dense with tropical rainforest and the canopy of the huge trees shade the road making it a very scenic drive. 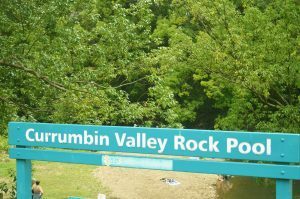 The Currumbin Rock Pools are ideal for children of all ages with both shallow and deep sections. Some caution must be taken though as the rocks can be slippery and sharp. It is recommended that children where reef shoes. The area has great facilities including toilets, BBQs, picnic tables and a huge grassy area. There is also a café across the road where you can purchase food and drinks, either eat in or take away. See Australian wildlife such as koalas, kangaroos, native Australian birds; see sheep shearing and Aboriginal dancing. Tickets start at $35 for kids. Location – Gold Coast Highway – Corner of Tomewin Street, Currumbin – see Map 1 above. See live bee shows, witness the process of honey being made from the flower and see tens of thousands of bees at work. Prices start at $10 for kids. Location – 35 Tomewin Street, Currumbin – see Map 1 above. 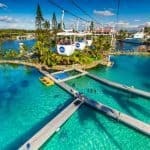 Great adventure playground including pirate ship, heaps of slides and rockers, a pedal power monorail, funny faces interactive boards and heaps more. The entire playground is fenced, which is great for the little ones and it also includes a Liberty Swing for kids in wheelchairs. There is plenty of parking, with on street areas, as well as a dedicated car park. Location – Laguna Avenue, Palm Beach – see Map 1 above. Great playground for the little ones with the main attraction being the pirate ship complete with lookout, treasure map and suspension bridge. Surrounding the pirate shop is a sandy play area complete with buried treasure, timber boat, animal rockers, barrel swings, climbing net, lots of hidey holes, walk the plank (beam close to the ground), barrel tunnels and cannons. The pirate ship is semi shaded and partly fenced on the carpark side. There are quite a few carparks but this area does get very busy so parking tends to spill out onto the Gold Coast Highway. 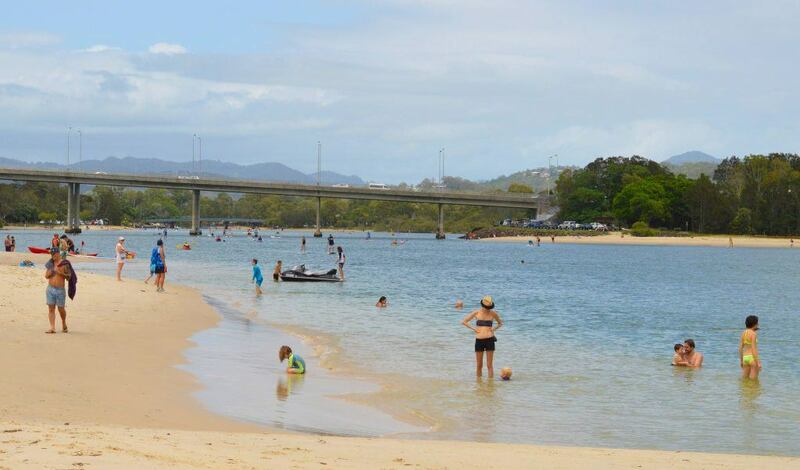 The playground is located on the opposite side of the Currumbin Creek so there is also calm water ideal for swimming. There is also a fantastic café here – Dune Café – about 100 metres away. It serves delicious food! 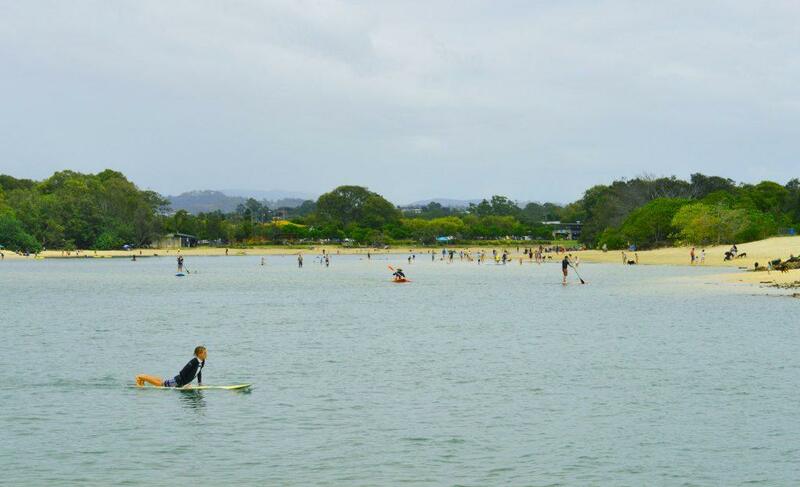 The area of Currumbin is not as developed as the rest of the Gold Coast – which is part of its charm! But this does limit the accommodation options. The ideal spot to stay here would be within walking distance to the Currumbin Creek. Check out either the Hills Apartments which is around $850 per week or the Little Cove Currumbin which is around $1200 per week. 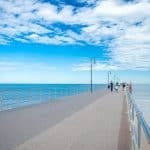 Both are 2 bedroom self-contained apartments perfect for families. See Map 1 above for locations. There are some places on Airbnb in the area but they are further away from the creek and are more expensive. 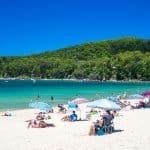 The other option is to stay at Palm Beach just across the creek – there are quite a few more options available here. Want to save this for later? Click on the image below and pin it to Pinterest. I love your writing style. These bite-sized information are exactly what I am looking for. Your article tells me exactly what I need. Cost, photos, details and your review. 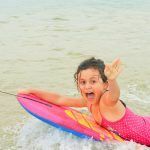 It’s a great page for family traveler’s FAQs. Enjoying your blog! Thanks so much Ralph. 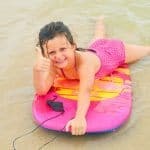 After years of reading blogs for my own travels, I provide information that I look for when I am researching a destination. Thank you so much for reading.